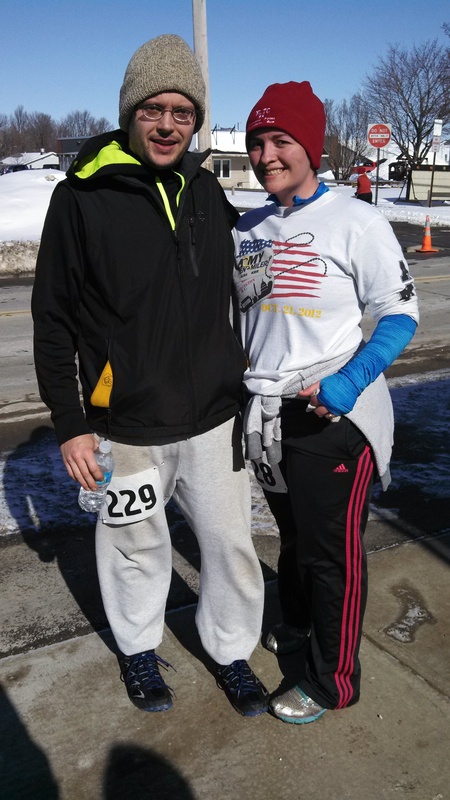 I told you about the Run to Chocolate in Fairfax, VT…but you may have noticed that I said we did TWO races last weekend! 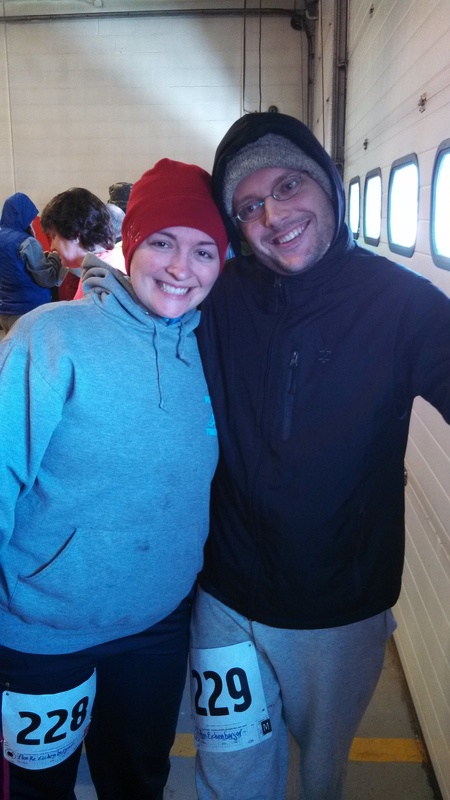 After our trip across the lake, we were ready to take on a windy 5k on Sunday. We woke up bright and early last Sunday morning to attend prayer at our church and ate a delicious breakfast of roast beef hash and eggs (thank you, Farmer Ben!). Then we relaxed for a few hours before heading north to Rouses Point, NY. Sunday was much colder than Saturday and it was WINDY, especially because this little town is right on the lake…and next to Canada. We hooked up with our friend Preston and his two little ones for the race. 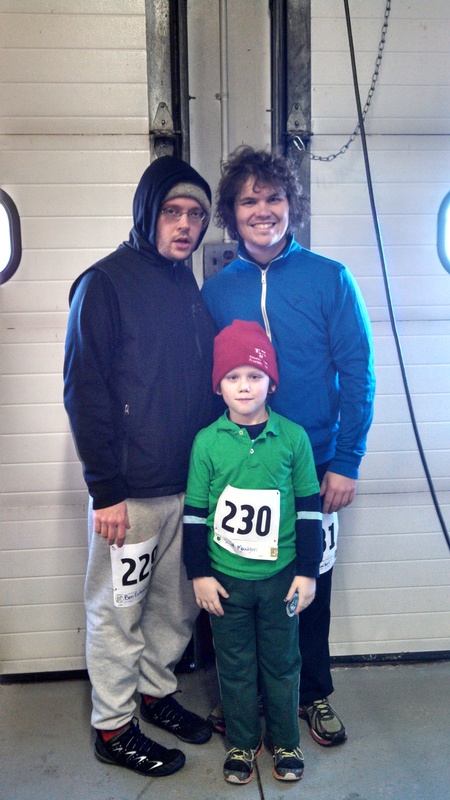 Preston took his 1 year old in the stroller and his 8 year old ran the race—his first 5k! We got there to register about 40 minutes before start time and I was lucky to be able to chat with my friend Gerry (who was a HUGE help at Strides for James last year). He even took some time and explained the course to me. We hung out inside the fire station and made small talk with other runners. I even got to chat with some reps from the Fleet Feet across the lake. I was a little nervous because we were running around town so there were a lot of turns, luckily there were cones and volunteers at just about every turn, so any confusion was almost non-existent. It was a little slippery, but it was nothing compared to the conditions we ran in the day before. This was another low-key race, we lined up at the start and as we took off, I could hear people around me chatting and laughing—always a good sign! I wasn’t planning on going super-fast, as we had raced the day before, but I also wanted to keep a pretty consistent pace. As I mentioned above, we were running through the town, near the elementary school, a local company, and by the water tower. Luckily the sun was shining and I ended up peeling off my heavy sweatshirt and tying it around my waist about 1 mile in. It was pretty windy, but the sun kept it comfortable. Of course, I didn’t run with a watch, so I have no idea what my splits were, but I ended up finishing at 29:01, which, is just about the same pace as I had run the previous day. I was super happy to see Ben waiting for me at the finish line (probably my favorite part of the race). He finished in 27:04…speedy! After I crossed the finish line, we jogged back to look for Preston and Jared (his 8-year-old). We saw Preston first, rounding the last corner but I decided to keep going to look for Jared…Farmer Ben walked behind me. After jogging back through the course, I finally found him, looking pretty tired and walking along with two women. He saw me and brightened up a little bit, showed me that he had scraped his hand after taking a spill and then started to slowly jog again. I told him we were almost finished and that seemed to brighten his spirits, his face lit up as he saw his dad and Ben coming with the stroller and he sprinted to them…forgetting he still had a little ways to go. We cheered Jared on as he got closer to the finish and reminded him to run as fast as he could through the finish line! He was super happy to be finished and we were all pretty proud of him for finishing his first 5k (with no training). He ended up getting a blue ribbon for being the first and only boy in his age group. How exciting is that? Farmer Ben and I both placed 5th in our respective age groups and we all got a pretty nice fleece hat and $10 Fleet Feet gift certificates out of the deal. Overall it was definitely a win and I am looking forward to doing this race again next year. I’ve never been much of a winter racer! But I am definitely seeing the appeal… I’m a big fan of low-key, local races! So there you have it, race number two of my 14 in 2014! Let’s chat, favorite winter race? Favorite Race Swag?